As we’re all the children of the void, let’s raise our horns and bang our heads to the superb new album by one of the most reputable and celebrated metal acts hailing from the beautiful province of Quebec. Founded by guitarist Vincent Harnois in the year of 2003 under the name Sinister Vengeance, Melodic Death Metal/Metalcore outfit Karkaos soon evolved into one of the most reputable and celebrated metal acts hailing from the stunning city of Montreal, located in the province of Quebec, in Canada. Melodic yet heavy, this unstoppable female-fronted band is unleashing upon the earth their brand new full-length installment, titled Children Of The Void, which features new frontwoman Viky Boyer, drummer Justine Ethier (Blackguard) and lead guitarist Samael Pelletier (Aeon’s Fall), and let me tell you that all these lineup changes were extremely positive to the band and to their sound, especially if you’re a fan of the music by bands such as Epica, In Flames, Children of Bodom, Arch Enemy and Amon Amarth. Featuring an elegant artwork by the immensely talented Colombian artist and designer Marcela Bolívar, as well as collaborations with guest artists Lindsay Schoolcraft from Cradle of Filth and Morgan Lander from Kittie, Children Of The Void offers the listener a considerably different sonority from the band’s previous albums, the 2011 EP In Burning Skies and the 2014 full-length release Empire, sounding more symphonic, imposing and polished than before. “We have been working hard for a long time to be able to give you an album that combines beautiful melodies to our own symphonic signature, groovy and brutal riffs to intensity as well as catchy choruses”, comments the band’s mastermind Vincent about Children Of The Void, and let’s say his “summary” of the album was spot-on to depict all the beauty and aggressiveness found in its 12 amazing compositions. The cinematic intro Babel leads us to the symphonic and metallic world of Karkaos before the explosive Skymaster hits us with heaviness and might from its very first second in a perfect fusion of the music played by Arch Enemy with Dimmu Borgir and Nightwish. Furthermore, pay attention to the precision of Justine behind her drums and to the song’s powerful chorus (“All hope is gone, I scream at heavens / This is not yet the end! / Brothers and sisters moan, I howl / Truth will prevail!”), as well as to the amazing Viky, who steals the show with her superb vocal performance. The following tune, Kolossòs, is a song tailored for breaking your neck in half due to the passionate vocals by Viky, its thunderous riffs and bass lines, and the infinite epicness that permeates the atmosphere. This is a newborn underground Melodic Death Metal classic showcasing mighty lyrics (“Kolossòs! The earth has spoken! / To the sun, you were reaching! / Kolossòs! The earth has shaken! / On the ground eternally, you’ll be laying!”) and the awesome guest vocals by Kittie’s Morgan Lander, as previously mentioned. Let The Curtains Fall ventures through the realms of Symphonic Black Metal the likes of Dimmu Borgir, but with a more melodic twist thanks to the potent keys by Sébastien Belanger-Lapierre while Vincent and Samael add their share of heaviness to the overall musicality; whereas Pale, one of the fastest and heaviest of all songs, is a brutal composition by Karkaos where the colorful-haired Viky is absolutely on fire while the other band members deliver amazing metal music, in special Justine with her potent beats and once again Sébastien and his cinematic keyboards. And their onrush of epicness goes on in the title-track Children of the Void, which will inspire you for some intense headbanging due to its accelerated pace, with Vincent, Samael and bassist Eddy Levitsky (who recently left the band) blasting sheer electricity through their strings, all spearheaded by the unstoppable Justine. Then it’s time for Rêverie, an epic bridge that rises in intensity and mystery until it reaches the form of the sensational Tyrants, a first-class Melodic Death Metal hymn with tons of symphonic elements to increase its obscurity and potency flawlessly delivered by all band members, with Viky beautifully growling like a she-demon, not to mention her also amazing clean vocals during the more melodic parts of the song. And changing a bit their style and sonority, they offer a very interesting and gripping song named Where Mushrooms Grow, sounding very harmonious, melancholic and dense, perfect for singing along its catchy chorus with the band (“Fields of sorrow / Where mushrooms grow / All trees, all hollow / We reap what we sow / Fields of chaos / Where mushrooms grow / Fading as we cross / Forgetting what we know”). This is indeed a side of Karkaos I would love to see them exploring more in their future releases so captivating it sounds. 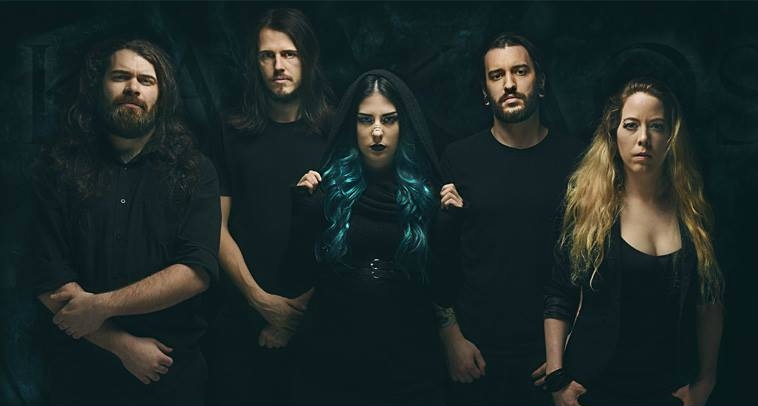 But the band obviously has more of their fast-paced metal to offer like what we see in Lightbearer, another solid composition showcasing beautiful vocal lines, thunderous riffs and bass lines and a rhythmic drumming. In my humble opinion, this song would sound simply superb with a full orchestra accompanying the band in the background, don’t you agree? Anyway, in The Beast, Vincent and Samael fire their cutting riffs while Sébastien is responsible for the epicness in the background, sounding highly inspired by contemporary Arch Enemy and The Agonist and also highlighting the excellent job done by Justine on drums, adding tons of intricacy to the musicality. Closing this amazing album of contemporary metal we have Bound by Stars, which sounds a bit generic and doesn’t keep up with the rest of the album, despite its purpose being to sound more complete and introspective than the other tracks. Nevertheless, there’s still a lot to enjoy in the song, such as the perfect vocal lines by Viky and the powerful performances by Justine and Sébastien with their instruments. 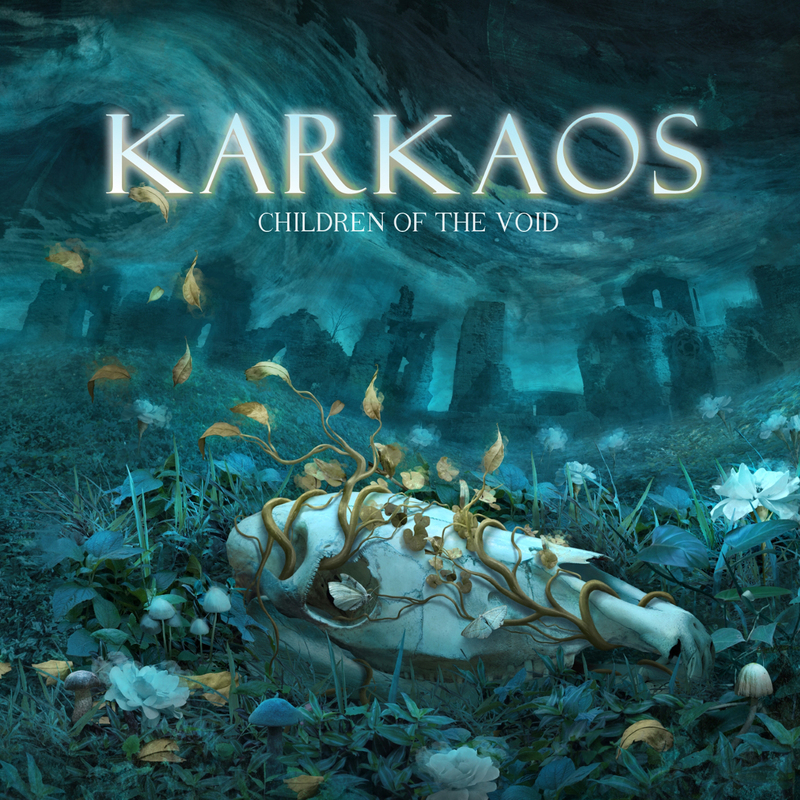 If you also consider yourself a “child of the void”, you can join Karkaos in their quest for Melodic Death Metal by following them on Facebook, listening to their fiery music on YouTube, and buy Children Of The Void at their BandCamp page, on Amazon or on CD Baby. Children Of The Void is undoubtedly going to be among the best releases of 2017 not only in Canada but also worldwide, and the band more than deserves that due to their commitment to their work and passion for melodic heavy music. Best moments of the album: Kolossòs, Pale, Tyrants and Where Mushrooms Grow. Worst moments of the album: Bound by Stars. This entry was posted in 2017 New Releases and tagged canada, children of the void, eddy levitsky, justine ethier, karkaos, kolossòs, let the curtains fall, lindsay schoolcraft, marcela bolívar, melodic death metal, metalcore, montreal, morgan lander, pale, québec, samael pelletier, sébastien belanger-lapierre, symphonic black metal, tyrants, viky boyer, vincent harnois, where mushrooms grow by Gustavo Scuderi. Bookmark the permalink.